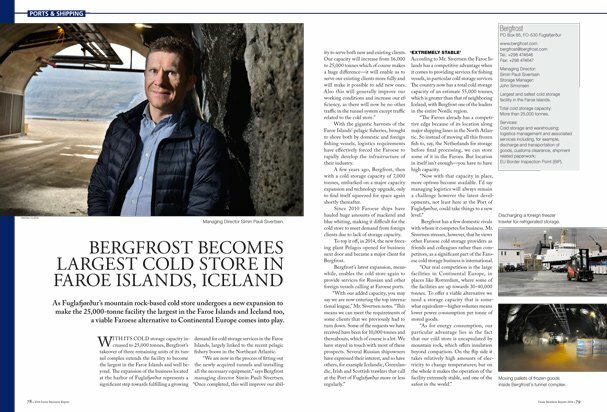 As Fuglafjørður’s mountain rock-based cold store undergoes a new expansion to make the 25,000-tonne facility the largest in the Faroe Islands and Iceland too, a viable Faroese alternative to Continental Europe comes into play. With its cold storage capacity increased to 25,000 tonnes, Bergfrost’s takeover of three remaining units of its tunnel complex extends the facility to become the largest in the Faroe Islands and well beyond. 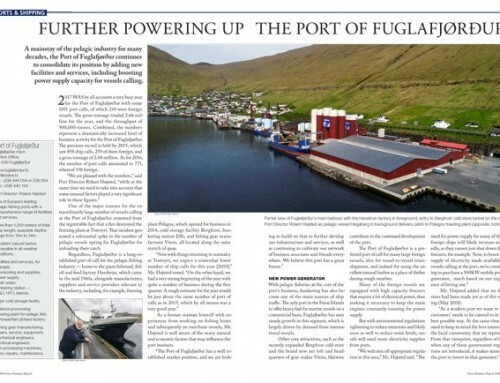 The expansion of the business located at the harbor of Fuglafjørður represents a significant step towards fulfilling a growing demand for cold storage services in the Faroe Islands, largely linked to the recent pelagic fishery boom in the Northeast Atlantic. 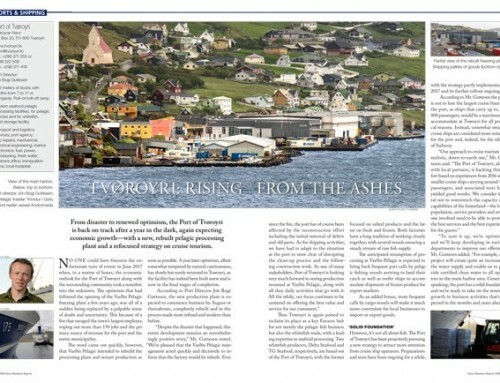 With the gigantic harvests of the Faroe Islands’ pelagic fisheries, brought to shore both by domestic and foreign fishing vessels, logistics requirements have effectively forced the Faroese to rapidly develop the infrastructure of their industry. 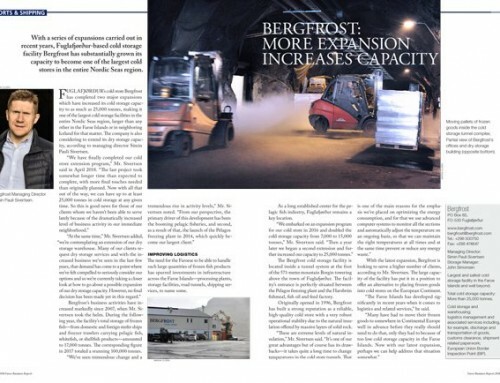 A few years ago, Bergfrost, then with a cold storage capacity of 7,000 tonnes, embarked on a major capacity expansion and technology upgrade, only to find itself squeezed for space again shortly thereafter. Since 2010 Faroese ships have hauled huge amounts of mackerel and blue whiting, making it difficult for the cold store to meet demand from foreign clients due to lack of storage capacity. To top it off, in 2014, the new freezing plant Pelagos opened for business next door and became a major client for Bergfrost. Bergfrost’s latest expansion, meanwhile, enables the cold store again to provide services for Russian and other foreign vessels calling at Faroese ports. 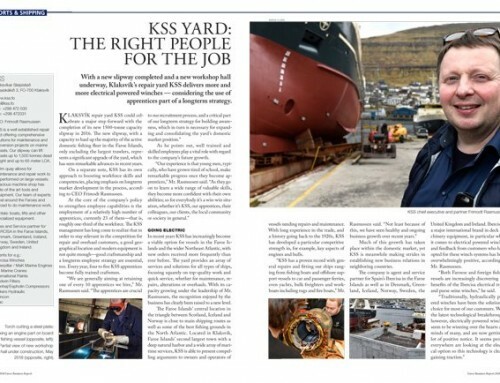 According to Mr. Sivertsen the Faroe Islands has a competitive advantage when it comes to providing services for fishing vessels, in particular cold storage services. The country now has a total cold storage capacity of an estimate 55,000 tonnes, which is greater than that of neighboring Iceland, with Bergfrost one of the leaders in the entire Nordic region. 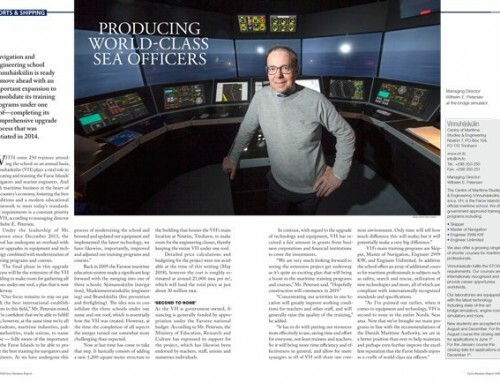 “The Faroes already has a competitive edge because of its location along major shipping lanes in the North Atlantic. So instead of moving all this frozen fish to, say, the Netherlands for storage before final processing, we can store some of it in the Faroes. But location in itself isn’t enough—you have to have high capacity. Bergfrost has a few domestic rivals with whom it competes for business. Mr. Sivertsen stresses, however, that he views other Faroese cold storage providers as friends and colleagues rather than competitors, as a significant part of the Faroese cold storage business is international. “Our real competition is the large facilities in Continental Europe, in places like Rotterdam, where some of the facilities are up towards 30-40,000 tonnes. To offer a viable alternative we need a storage capacity that is somewhat equivalent—higher volumes means lower power consumption per tonne of stored goods.